Admittedly I was apprehensive about what might be in this match up in the NJ Meadowlands. A wounded animal is the most dangerous and that’s what we saw in our NFC foe. To make it worse, their franchise QB was benched after 210 consecutive starts by the coach, who’d be terminated after that game. Would the Giants play above their level? That was my concern. I saw this as a tight game, maybe 16-13 or even 13-10. Mid way through the 4th quarter that projection looked like the nail biter, I envisioned. In the span of less than four minutes, Dallas put up 21 points to blow this slug fest, wide open. All in all, Dallas put up 27 unanswered points, showing just how anemic the Giants have been this year. Final score 30-10 lets the faithful enjoy a good nights sleep, but it was a little too close for comfort, for a little too long. The dreams still alive! This game started out really as I envisioned, with little action on both sides. Both teams traded early FG’s and execution was challenging. On the next Dallas possession, It started with a first down with runs by Morris & Dak, then Hanna made a sweet catch for a first down. 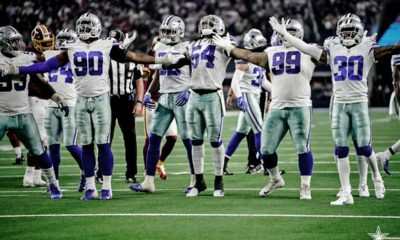 From there it was a comedy of errors, first Dez getting handcuffed and dropping one, then Beasley couldn’t bring one in. Both catchable balls from Dak. If that wasn’t enough, Mr. Automatic, missed a FG attempt that he normally splits the uprights with? Two possession later, NY took their last lead with a 1 yard TD pass by Manning. The next possession was all Dak & Dez, as they connected twice. First for a ten yard reception, then a slant that Dez broke a tackle attempt by his defender and ran untouched from there to the end zone to complete the 50 yard play. This capped off the first half at 10-10. This was a game that the Cowboys defense was controlling fairly well thru the first half. The pass rush was barely a factor but regardless the coverage seemed to pick up right where it left off in the last game. Need to watch the ALL 22, as Lawrence was upset with the officials allowing him to be tackled without a flag being thrown. The young guys were solid from the start as Lewis an Awuzie took turns breaking up passes or keeping their receivers from gaining the yardage needed on third downs. 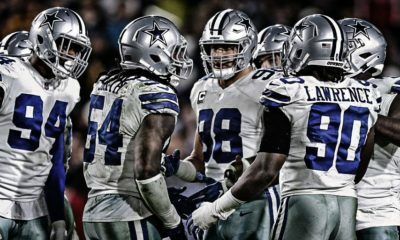 The return of Sean Lee was obvious from the start as he was in 18 tackles, with one big one for a loss of 7 on an end around. The Giants had a few positive runs, but for the most part they weren’t doing any damage. Eli was ineffective throughout the game. He wasn’t making mistakes in the first half but he wasn’t able to make any big plays either. Frankly, I never felt as though Eli had the ability to move them. When I watch a game with Eli, I know statistically he can give you a few Christmas gifts and its that time of the year. The Cowboys exchanged punts to start the third and on the second possession of the 2nd half, Dan missed another, but at least this one was from long distance. No less bizarre, to see him miss a FG? On this series, Witten was flagged for holding on a big run by Morris, that had to come back. Three possessions later we had the longest play of the day, a catch and pivot by Beasley that went for 53 yards. The next play “Cap”, finished off a drive with a 20 yard TD reception down the seam and #82 was mobbed by his teammates. Great vindication! This came with just under 8 minutes remaining in the game and at the time, who knew that the floodgates were just bursting open? 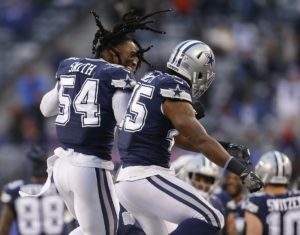 The fun wasn’t over, the next possession, featured a tipped pass by Awuzie, that popped into the waiting hands of who else, but #50, Sean Lee inside the Giants 20. 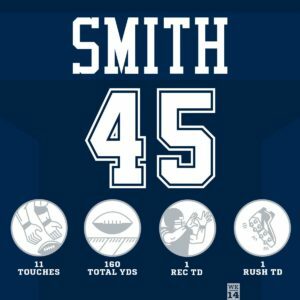 Three plays later, the “Smith’s”, Tyrun & Keith, led the way as they sprung Rod Smith for a 16 yard gallop around the left side. This too, could be labeled a run to daylight! This completed the TD barrage of 3 TD’s inside of four minutes late in the fourth. All that was left was to finish out the game, but ole Eli had a final Christmas present that Jeff Heath was happy to haul in to put Eli & the Giants out of their misery. There were several players who stood out in this game. Naturally a QB who throws for 300 plus with 3 TD’s, gets the first of the props. 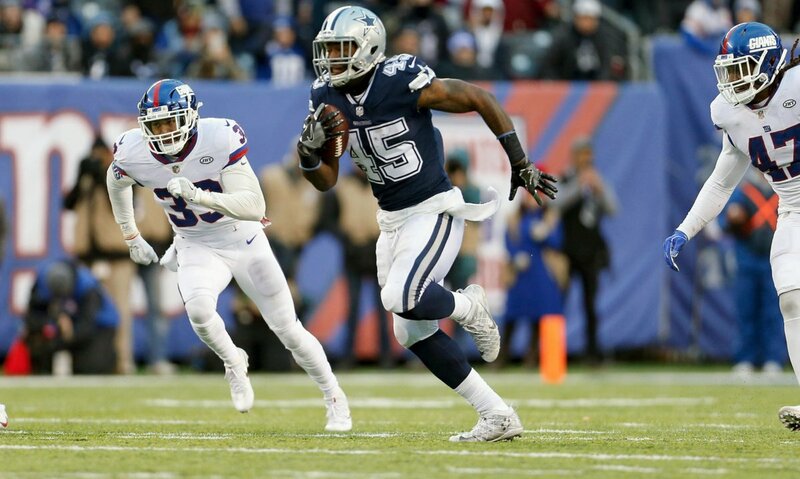 Rod Smith, who serves primarily as the second back to provide a little rest for Alfred Morris made major contributions late in the game with his two TD’s and 160 total yards on all of 11 touches. Let’s not forget about his heads up play on the first series, when a pass was tipped at the line and he scooped it up and ran for about 8 yards and a first down. 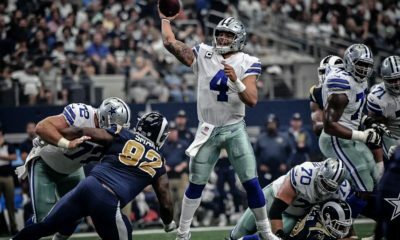 He made the key block on the 53 yarder to Beasley as Rod slid over to pick up the blitzing safety and give Dak just enough time to get the ball to Cole. Just his day! I’m expecting that he’ll be the back up to Zeke next year. 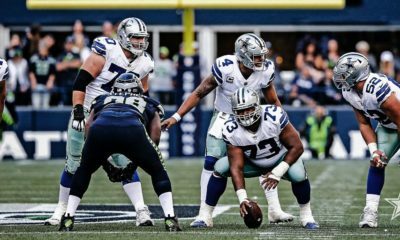 Don’t dismiss the likes of Sean Lee and two CB’s, Lewis & Awuzie, that were very solid from the opening whistle. Much was made of Sterling Shepard and coverage primarily by Xavier Woods. Anyone really know that Shepard was active in this game? Think the young man, my Pet Cat for ’17, did his job today. Really all of the safeties were effective in this game and that’s a really nice situation for a coach to work with. My brother in law, Bob sent a text to me as follows: “Thank you Cowboys. Going for top draft pick at this point”. I felt bad for Bob, his team was doomed when the WR’s dropped like flies. Their problem for many years now has been that Mr. Ordinary, Mr Average QB, Eli, can go either way. His record under center, drops to 110-101, while his career QBR of 83.8 wasn’t reached in this game. I wrote a story, that I released on Friday that doesn’t find him to be anything more than average for a third tier QB (10-15). More power to him that he literally made a fortune from his meager talents and that the NY media has anointed for the HOF. But he really only has about a 50/50 shot of winning on any given Sunday when you come right down to it. There are four men on this team, named Smith and these two, 54 & 45, are two really happy brothers, caught on camera celebrating the win and special day for Rod! Gotta love when a young man does the work, fights to make the practice squad, put in his time on specials then when given a shot, comes through and has a great day! Atta boy Rod! Keeping the Dream Alive vs The Silver & Black!